St. Louis Fed President James Bullard discussed two views of future policy rate increases: the FOMC’s scenario and the market-based one, while speaking at the Official Monetary and Financial Institutions Forum’s City Lecture in Beijing. 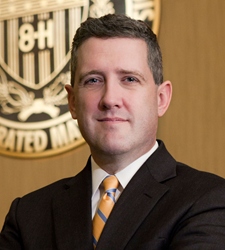 Federal Reserve Bank of St. Louis President James Bullard discussed “Slow Normalization or No Normalization?” at the Official Monetary and Financial Institutions Forum’s (OMFIF) City Lecture on Monday. Bullard noted that recent U.S. monetary policy discussions have been dominated by issues related to the possible pace of increase in the Federal Open Market Committee’s (FOMC) policy rate. He discussed two views regarding the expected policy rate path: the FOMC’s scenario and the market-based scenario. Bullard briefly compared and contrasted each view, starting first with the FOMC’s scenario. He cited three factors in favor of the FOMC’s scenario of a slow normalization of the U.S. policy rate: relatively strong U.S. labor markets, inflation measurements moving closer to the FOMC’s target of 2 percent, and waning international headwinds. “By nearly any metric, U.S. labor markets are at or beyond full employment,” Bullard said. For example, he noted that job openings per available worker are at a cyclical low, unemployment insurance claims relative to the size of the labor force are at a multi-decade low, and nonfarm payroll employment growth has been above longer-run trends. In addition, the level of a labor market conditions index created by staff at the Board of Governors continues to be well above average. While inflation has been relatively low in the U.S. during the last several years, Bullard explained that large movements in oil prices have had a major impact on headline inflation. “Measures intended to give an indication of inflation movements net of oil price effects have been trending somewhat higher,” he said. Thus, he noted that the FOMC’s projection of a slow rise in U.S. inflation as the effects of a stronger dollar and a decline in oil prices wear off appears to be happening, as indicated by the rise in smoothed measures of inflation over the last year. Bullard then turned to the discussion of the impact of negative global factors on the U.S. economy and how some of these factors appear to be dissipating during the first half of 2016. He looked at two factors that have been widely cited in the international headwinds discussion: global financial stress and the negative impact of a stronger dollar on U.S. gross domestic product (GDP) growth. Bullard then discussed two factors in favor of the market-based scenario of almost no normalization of the U.S. policy rate: the slow U.S. real GDP growth and low U.S. inflation expectations. Bullard noted that real GDP growth has been slower than trend in recent quarters, with first-quarter real GDP growing at an annual rate of just 0.5 percent, according to the most recent estimate. This estimate may be influenced by the “residual seasonality” issue, he said, explaining that first-quarter real GDP has been low since 2009. “Still, combining actual data from the second half of 2015, the first quarter of 2016, and tracking estimates for the current quarter, the suggestion is that the U.S. is growing below a trend pace of 2 percent,” he said. “The slower, below-trend pace of recent U.S. growth is inconsistent with a slowly rising path for the policy rate,” he explained. He noted that market-based measures of inflation expectations tied to the Treasury Inflation-Protected Securities (TIPS) market are based on consumer price index (CPI) inflation, but that the FOMC’s target is based on personal consumption expenditures (PCE) inflation. The latter generally runs about 30 basis points lower. “Current readings on TIPS-based inflation compensation are difficult to reconcile with credible longer-run FOMC policy to maintain an inflation target of 2 percent PCE inflation,” he said. To sum up, the FOMC median projection for the policy rate suggests a gradual pace of rate increases over the next several years, Bullard said. At the same time, the market-based expectation for the policy rate is much shallower, with only a few increases over the forecast horizon—that is, almost no normalization.